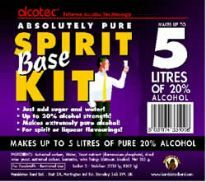 Complete Alcotec High Alcohol Kits (Ingredient Packs) Make Half Strength Vodka Base fro Spirits and Liqueurs. Alcotec ingredient packs contain a turbo yeast, but also have finings and activated carbons . . . you need these extra bits to produce a clear and drinkable half strength (20%) Vodka base that can be used to create liqueurs (by adding essences/flavors).